The Borders’ Community Action Team (CAT) is continuing to take action against important local issues, with another strong performance in the third quarter of its first year. The police team tackled a wide variety of criminal activities right across the Borders. Anti-social behaviour and drug related issues in Duns saw CAT patrol the area and help reduce the number of incidents significantly. 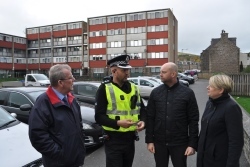 Members of CAT carried out visits to an area in the aftermath of a robbery which was appreciated by local residents while in Eildon the team’s visits to a large retailer in Galashiels helped lower the number of shoplifting incidents at the shop. Youth issues at Hawick supermarket were reduced by patrols with further work taking place in January, and tickets were issued following complaints about parking in the town. An increase in thefts in Peebles, Innerleithen and West Linton in November was tackled by regular patrols combined with road checks, which saw incidents reduce significantly. The team was also part of drugs raids in Galashiels in November which saw six people appear in court after the recovery of class A, B and C drugs. “The community action team was formed to provide a dedicated resource to tackle local issues across the Borders. “In the nine months since it was formed, they have carried out a total of 229 drug searches on people and premises, made over 80 road checks and issued more than 630 parking tickets. “The Council made a significant investment to help launch the community action team and we are pleased that the team continues to take action on issues that matter to our communities, such as drugs, anti-social behaviour, illegal parking and theft. “The first nine months of the CAT has been a success and during the third quarter we have again dealt with a wide variety of community issues which have been raised by the Borders public. “These included youth issues at Halloween and engagement with the Borders public and businesses during the busy festive period, including regular foot patrols across all town centres in the area to help curtail retail crime. “We also provided reassurance and a visible presence when travelling criminals targeted the Borders and have taken significant action to tackle drugs in our communities, including a high success rate for premises and person searches.